I design beautiful, functional, family spaces. Adapt a charming bungalow for a growing family or add warmth and detail to new construction. Let's make your house Truley Home. The hub of any home – where bills get paid, problems get solved, vacations get planned, homework gets done and occasionally, meals get made. Your quiet space to relax or a practical place to get ready – both make life better. Built-ins, build-out, built-to-last – let's reimagine your space together. 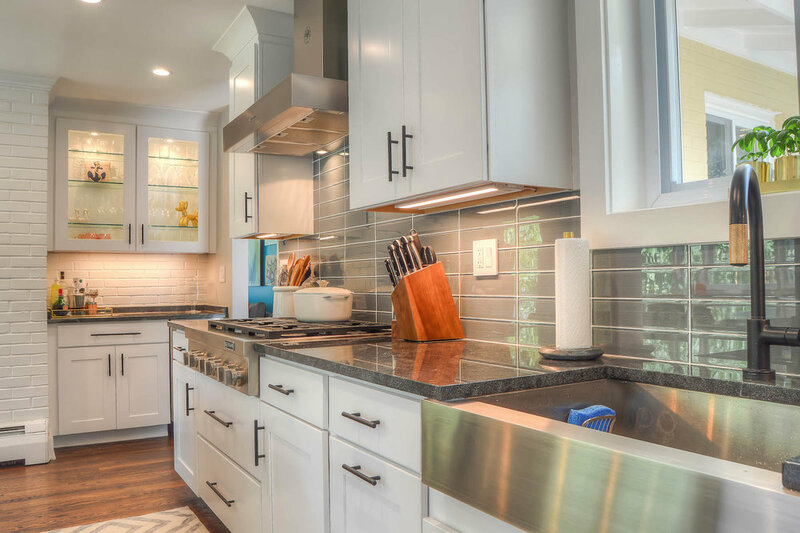 An amazing young, professional couple in Southwest D.C. reached out for help remodeling their kitchen. It was closed in with little storage and countertop space. We removed two walls and relocated the HVAC return vent to open the kitchen to the family room and dining area. The pop of blue in the backsplash is one of my favorites and reflects the couples love of color! This compact kitchen features lots of fun storage to maximize every inch. This young, Yacht Haven couple had been dreaming about a new kitchen since they purchased their home three years ago. They both love to cook. She is an incredible baker, and he is a chef in the Navy. Making sure this space was functional yet still fit their modern style was a top priority. We removed a wall opening the kitchen to the main level, creating enough room for a center island and framed an unused half wall to add more storage for baking supplies. We also added a backdoor and deck space to make grilling and outdoor entertaining easier and more enjoyable. 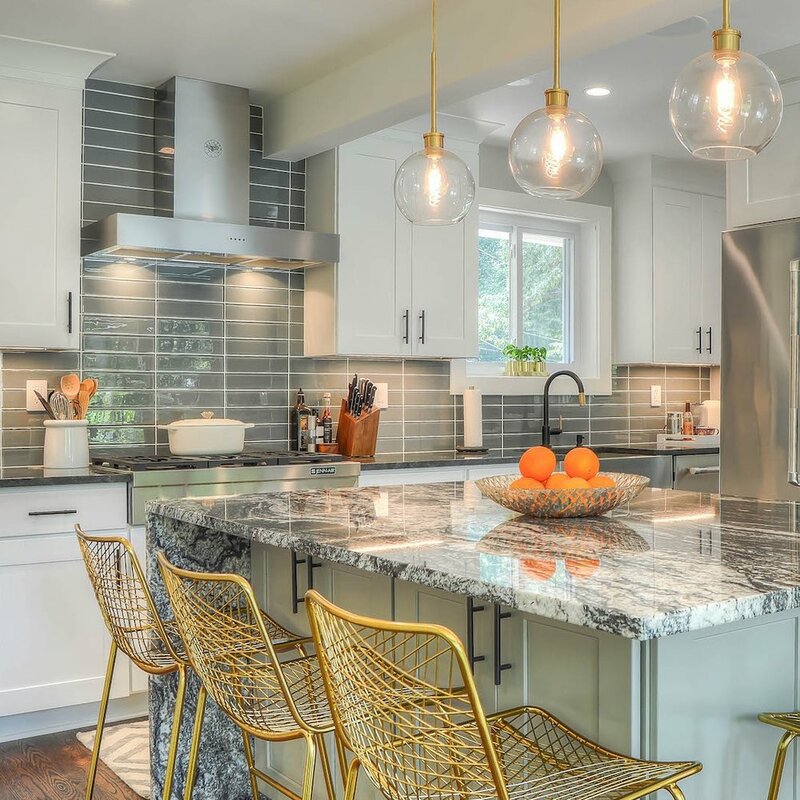 The client’s touches of gold, black, and waterfall countertop edges are the icing on the cake. We created this relaxing retreat for a delightful couple with two, active, school-aged children pursuing a balance between work and family life. We removed an existing built-in bathtub and wall allowing natural light from the skylights to flood the now open room. A sleek freestanding bathtub and drum chandelier are the focal point of the room. Unique finishes including chrome fixtures with matte black accents, white subway tile with black grout, a white Carrera marble hexagon shower pan, and soft grey cabinetry with marble countertops make this bathroom a timeless classic. The mudroom has become one of the most important rooms of the home. It’s the command center: the place for your gym bag, yoga mat, muddy boots, bookbags, and cleats. This mudroom was created by removing an entryway coat closet and modifying the garage. The custom cubbies and cabinets give this incredible family the storage of their dreams. This wonderful family wanted to create a kitchen that was open and inviting to family and friends. 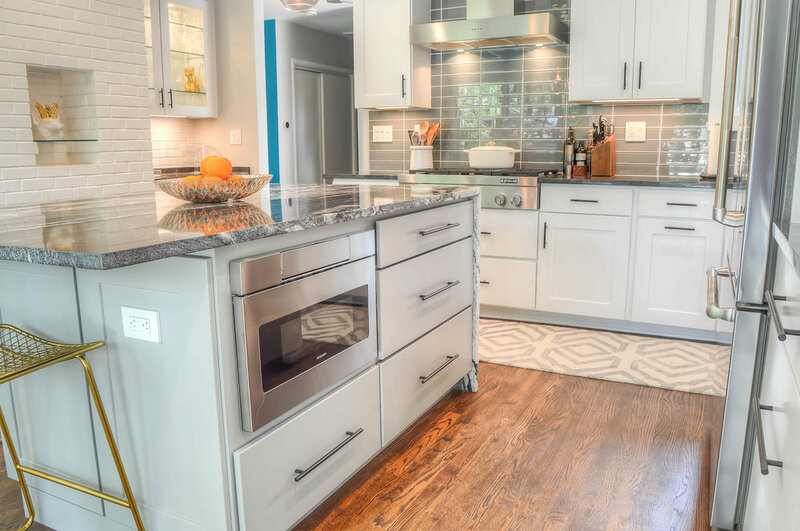 We transformed a space with dark cabinets and countertops into the light, bright kitchen reflected in their inspiration photos. The addition of a structural beam allowed us to remove a wall and angled pantry closet which crowded the room. These adjustments created the openness the clients desired and allowed room for the second island with an L-shaped bar and seating. The center island is an amazing space for meal prep. Storage was carefully thought through to make sure all items had their proper place including the creation of a special snack area for their three children. 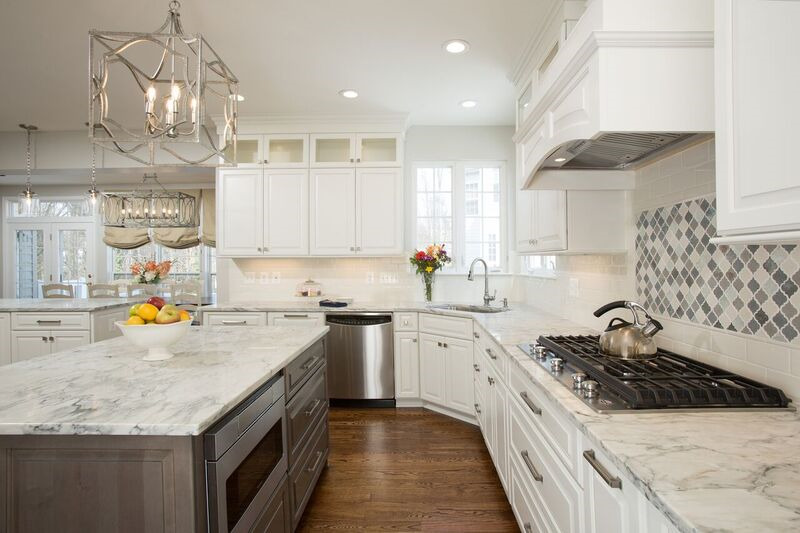 The addition of white cabinets and quartz countertops help create an open, bright space while the decorative light fixtures and backsplash focal tile over the range give this kitchen a great personality.